I recently had the pleasure of conducting an interview with Matthias Nagler. For those of you unaware, Matthias recently earned himself the distinction of being the first person to produce an 8 simultanous player SNES game. The game in question is N-Warp Daisakusen, and can be handily downloaded at his website. Matthias was kind enough to agree to an interview, and during the course of this interview I began to realize exactly how devoted Matthias is to his craft. TIGS: Well I suppose we should start this off with the good old standard introduction. Matthias: My name is Matthias Nagler, I’m currently living in Germany and was born in 1983. I usually go by the name of d4s on the net. TIGS: So how long have you been doing hobbyist console programming? Is the SNES your first experience with console programming? Matthias: Yeah, the SNES is the first and only console I’ve coded for so far. Actually, I didn’t have any programming experience prior to that at all. TIGS: Wow, talk about jumping into the fire! So did you start programming in assembly from the get go, or did you learn another language then ease yourself into ASM? Matthias: 65816 Assembler was the first programming language I learned, yeah. Assembler is considered obsolete by quite a few people, but I really love how you’re almost directly interfacing with the hardware in ASM. On old and slow consoles, you hardly have a choice, anyway. TIGS: Your game has earned the distinction of being the first simultaneous 8 player SNES game. What made you decide to go with 8 players? Eight is the maximum number of joypads you can connect to the SNES with official peripherals, so I went with that. TIGS: Tell us a little more about N-Warp. How large is this event and what does it cover (Enthusiasts/programmers/etc)? TIGS: In terms of technical limitations, was it difficult to actually incorporate 8 players? Somehow it seems that the SNES was never actually designed to support more than 4 controllers. Matthias: It isn’t difficult at all. I’m using two Multitaps on each joypad port of the SNES. Each Multitap has 4 additional joypad ports for a total of eight controllers. As long as you know how to access the Multitap, it’s very straight forward. I think the reason why licensed SNES games never supported more than five controllers is that Nintendo enforced a couple of rules regarding this device. If you wanted to use the Multitap in your licensed game, it had to be plugged into joypad port 2 on the SNES. You even had to spit out an error message if the user tried to connect it to port 1. It’s not perfectly clear why they wanted to have it that way. Chances are they either didn’t want to confuse consumers, or it was due to power consumption. Either way, the Multitap does work perfectly fine in both ports. TIGS: Considering this game was made with your in-progress engine in a rather short time, will we ever see this game expanded? Any plans to make a (separate) full game when you are finished with the engine? Matthias: Honestly, I don’t know yet. I have a habit of not going back to my previous projects so chances are that I won’t expand this game once it’s released. It was never designed to be more than a quick multiplayer fix and I pretty much like it that way. It may not be a full game, but nevertheless, I think it’s important to get it out there to show the people that somebody still cares. I’d be glad if this would spark some interest for SNES development again. As for future projects, I will most certainly try to come up with something and you can bet it will be on the SNES. There’s no master plan yet, I’m just playing with ideas at the moment. I’d love to create a full game with a group of dedicated people at some point in the future, though. TIGS: I’ve also seen videos of your advanced SNES loader. Think you can give a quick rundown on what it does/how it functions? How would one go about using this on their SNES? Matthias: Actually, it’s not a loader, but a modified, region-free Super Nintendo. It basically adds a firmware to the SNES. When you start it up, it displays all sorts of useful information about the inserted game cartridge, switches to the right video mode and stuff like that. Technically, it’s a custom chip and a firmware flashrom on a pcb that’s soldered into an SNES, so it is probably comparable to modchips for other consoles. The difference being that it is not for playing pirate games, but running imports and doing it with style. I’ve just produced a limited run of 50 units and these are long sold out, I’m afraid. This wasn’t meant to be assembled by the user. I mainly wanted to test waters and gauge interest with that project. TIGS: I imagine you’ve played your fair share of SNES games, so which ones are your favorites? Matthias: Yeah, I’ve played quite a few. My favorite games on the SNES are Seiken Densetsu 3 (japanese sequel to Secret of Mana), Treasure Hunter G (again, japanese RPG) and Battletoads in Battlemaniacs. TIGS: Massive love of the SNES aside, do you think you’ll ever cross over to another home console, living or dead? I’ve been itching for a new classic gameboy game myself. Matthias: It’s a possibility for sure. For example, I`m quite interested in the Virtual Boy. I just can’t think of an interesting project for that one right now. Me working on more recent consoles is probably less likely. One of the things I enjoy about older consoles is overcoming quirky hardware limitations. If it gets too easy, it becomes less interesting to me. 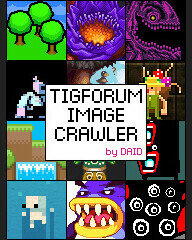 TIGS: Obligatory plugging of your website goes here! Matthias: http://gra.dforce3000.de/ is the page that’s supposed to cover all my homebrew projects from now on, I think that’s the most relevant one for now. You can download the game there as well, if you want to give it a try. TIGS: Well I think we’ll call it a wrap here! Thanks so much for agreeing to this interview! Any final words for our loyal TIGSource readers?